When a device has no power and/or not responding to end-user commands, it could be due to a faulty hardware or software. But before you jump into conclusion, there are still some things you can do to help your device get back to life prior to paying a visit to a service center. If you have a Samsung Galaxy S4 that has no power or not responding, you may refer to this troubleshooting guide. Be sure to test your device to see if the problem is resolved after performing each step. Otherwise, continue to the next troubleshooting step/method until you get your phone back up and running. a. Power off the phone. Be sure the correct power button is pressed and held for 3-5 seconds. Doing so will verify that the phone does not power on. b. Once the phone is completely powered off, remove the battery cover. Use the provided slot, then carefully lift and detach the cover. c. When the battery cover is removed, take off the battery. d. Now, remove the SIM card. e. Re-insert the SIM card with the gold contacts facing down and the notch located in the top-left. f. Replace or re-insert the battery. Make sure the connectors on the battery are properly aligned with the connectors on the device. g. Finally, replace the battery cover. To lock it into place, press in on the cover. 2. If problem persists, after ensuring the SIM card is properly inserted, then check for battery charging issues. There is a possibility that the phone does not have enough power to boot because it won't charge in the first place. Also make sure you are using a manufacturer approved battery, same thing with the charger and USB charger cable. In case you are using a wireless charger, make sure it is Qi certified and is marked with the Wireless Power Consortium logo. This is the Wireless Power Consortium logo. To prevent battery charging issues, make sure the charging plate is plugged in. 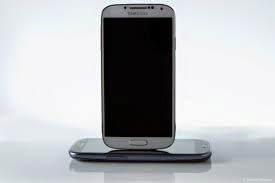 Properly align the phone on charging plate until both the phone and charging plate indicate it is already charging. If it does not, remove any possible obstructions like a cover, pillow, and the like. Also observe proper positioning when charging with a wireless charger. The proper way is to place your phone on the left on the charger for at least a minute. Doing so will esnure the phone is charging properly. 3. After performing the previous methods and the problem persists, perform a soft reset on your Galaxy S4. The process is just similar to turning the phone off and on. a. Press and hold the Power button. b. Select Restart from the options. If you are unable to perform a soft reset with the above methods, simply remove then re-insert the battery. It'll do the same. 4. If problem continues, switch to safe mode. When you're phone is in safe mode, it will run in a diagnostic state or returned to default settings. This state will help you easily determine if a third-party application is causing the phone to freeze, unresponsive or won't power on. a. To get to Safe mode, press and hold the Power button located on the right corner until the Phone options prompt shows, then release. b. Tap and hold Power off until you see the Restart in Safe mode prompt displays. c. Tap Turn on Safe Mode. Please be patient because the restart process may take longer to complete. Safe mode will then appear in the bottom-left of the home/unlock screen upon restart. Now that Safe mode is already enabled, you may already begin testing the phone and app functionality. If the issue does not occur, then the problem cause has been isolated to a third-party app. This means you have to remove all recently installed or update applications. If you want to exit or disable Safe mode, just power cycle your phone, then re-install and test each application one at a time. This will help you identify which app is causing the problem to occur on your device. 5. If the problem remains after diagnosing your phone in Safe mode, then you may consider opting for your last resort, that is performing a hard reset. In this regard, be sure to create a backup of all these data or files before you perform a hard reset. Once you've already created a backup of all your data, you may now start with the following steps. 1. Make sure the phone is powered off. 2. Press and hold the Power, Volume Up and Home buttons, simultaneously. 3. When the phone vibrates, release the Power button. Continue holding the Volume and Home buttons. 4. When the Android logo appears, release the Volume and Home buttons. 5. Select the option to wipe data/factory reset, from the Android system recovery screen. Use the Volume Up/Down buttons to highlight and Power button to select an option. 6. Select Yes--delete all user data. Wait until the factory data reset is complete. It may take several seconds. 7. When data reset is finished, select reboot system now. It may take several minutes for your phone to boot up. Just wait until the reboot process is complete. If this fixed the problem, then you're good to go! Otherwise, we suggest you should take your phone to a nearby authorized Samsung repair center in your place. Or may also contact your phone carrier to escalate your device issue.